But walk around the back and you find something amazing. 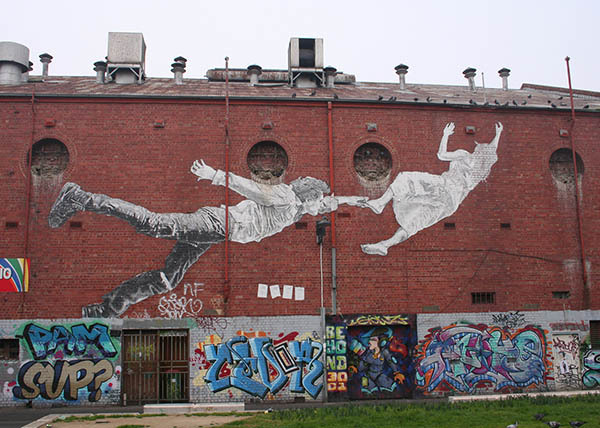 A huge paste up artwork by Baby Guerrilla covers almost the whole wall. The story of the building’s decline is pretty tragic. John Lack* writes: “On Saturdays the picture theatres inhaled thousands of kids at one o’clock and exhaled them again between three and four. By the early 1920s adults could go to the pictures or a dance any night of the week, excepting Sunday … Between 7 and 8 o’clock the verandah lights came on at the Barkley, the Troc and the Grand … orchestras were tuning up at the Victor and the Orama, and further afield at Green’s Palais, the Seddon Palais and at Trimbles. The O’Sheas opened their Dancing Academy at the former Victor Theatre in 1922 …at the Royal Hall, the Toronto Orchestra was all the rage”. These days Footscray has no cinemas. Back then it had at least three. Footscray must have been a buzzing place with a vibrant sense of community and social life. However, this came to an end in the Depression (early 1930s), and the Grand closed its doors for a few years – although it was still used for political meetings, at one of which the Prime Minister, Joe Lyons, was hooted and booed when he spoke on behalf of the United Australia Party. In 1936 the theatre was reborn as the ‘New Grand’, now splendidly fitted out, Lack says, with “Glass doors, a terrazzo foyer, a marble staircase, new seating encased in vermin-resistant Dunlopillo sponge rubber … acres of fancy plaster and a glorious golden stage curtain. The New Grand was the Cinderella of Footscray’s cinemas.” In its great days it had more than 1,000 seats and must have been a great place for a night out. How many young lovers got together in those romantic, vermin-resistant Dunlopillo seats, thrilling to the glamorous adventures of Clark Gable, Errol Flynn and John Wayne? 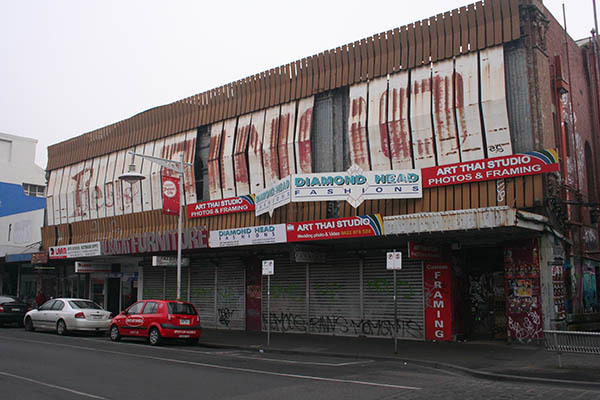 The first of Footscray’s cinemas to open, The Grand was also the last to close. By the 1970s it was already regarded as “pretty archaic” by its patrons. Its owner tried to keep it viable by getting rid of the foyer and the stalls. But the Grand era came to an end on 8 April 1987, with the last showing of the last picture, ‘Heartburn’. Shortly after, the Fiesta Bingo Hall moved in to the upper space, run by local businessman and ‘larrikin of the dance floor’, Kevin Gibson. By 2004, this too had closed, bingo being well past its heyday. 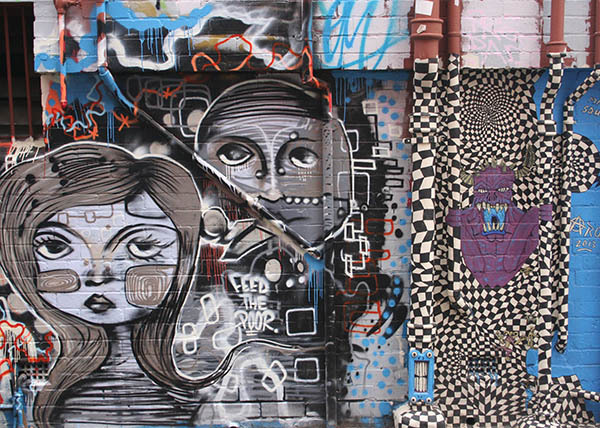 Around the back of the cinema, in F.J. Maddern Square, there is a gallery of street art in a mixture of styles. Is it too much to hope that The Grand will ever rise again? Perhaps. It must have seemed unlikely that The Sun Theatre in Yarraville would ever reopen its doors when it fell into disuse, but today it is a popular venue. You have to suppose that renovating the Grand would take enormous reserves of determination and cash. Walk around the back, though, and take a look at the artwork by Baby Guerrilla. Her work encourages you to imagine all kinds of possibilities, however grim the surroundings in which the artwork appears. That would be great – but probably not a thousand seater! It would need to be split into a number of small theatres, as they have done at The Sun. What a beautifully written piece – I remember my father telling me about how popular The Grand was and how my grandfather, a carpenter, would regularly do maintenance work there. It would be wonderful to bring the Square outside back to life again. Thank you! That’s quite a family history you have there with the Grand. It must have played a memorable part in the lives of thousands of people. Wish I had had the opportunity to see it in its heyday. What about The La Scala? Footscray had four theatres. The La Scala at 29 Leeds Street ran from 1957-1969, showing mainly Italian movies. The FJ Maddern Square used to be a row of small single fronted attached Victorians. I lived there for a number of years in the early 1970’s. We would play ball against the back brick wall of the Grand, and when occasionally management would forget to lock the exit of the cinema we could sneak up to catch a free show.